Home video surveillance equipment is a remarkable way to protect your home and family in Fort Lauderdale. There are several types of home video surveillance equipment that are efficient, yet inexpensive. IP cameras are otherwise known as Internet Protocol cameras. These cameras allow you to monitor images from your smartphone or computer. They are easy to set up and require a high speed Internet connection and an Ethernet cable. IP cameras work by downloading software to your computer or smartphone. The software allows you to monitor images from multiple IP camera locations. The IP camera has its own unique IP address. You can monitor the images from anywhere in the world. Hidden cameras are extremely small and blend in with your home’s accessories or furnishings. These cameras are often used in the home for various reasons such as monitoring nannies or loved ones. Hidden cameras are available in the form of smoke detectors, fire sprinklers and wall clocks. These cameras are easy to set up and are priced inexpensively. When you are considering purchasing hidden cameras, you should talk to a knowledgeable professional at a home security store. Search online to find home security companies or visit your local home security retail store. A popular home surveillance camera is the infrared camera. These cameras offer color images during the day, and they switch to black and white at nighttime. They can capture images even in complete darkness. These popular cameras are also weatherproof and ideal for use around the perimeter of your home. You can choose a camera that records images with motion detecting technology. This can help conserve the camera’s batteries. The advance in infrared technology has made the price of these cameras lower than in the past. Seek professional installation to ensure the cameras will work properly. The number of cameras you choose will also determine the price of your home security system. Domed home surveillance cameras are a good choice, because the dome that surrounds the camera makes it difficult to determine which way the camera is pointing. They are also tamper-resistant and provide a clear image. Domed cameras are available for use both indoors and outdoors. They are also available with infrared technology for nighttime use. Domed security cameras are often found in shopping malls, retail stores and businesses. These domed cameras can accommodate up to 64 camera systems and are usually monitored 24 hours a day. You can also buy these security cameras for your home and monitor them from your computer. Wireless home surveillance cameras offer easy installation and monitoring. These popular cameras can be monitored from any electronic device that has an Internet connection. They are also relatively inexpensive, and you won’t have to worry about wire installation in your home. IP cameras work with a network video recorder. These cameras can also provide two-way communications. You can find wireless home surveillance camera equipment online or at a security retail store in your area. 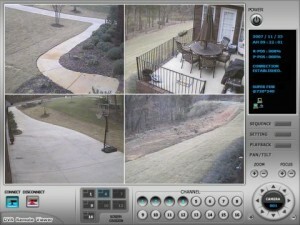 Monitoring your surroundings with video equipment can give you peace of mind when it comes to home security. If you are not sure which home surveillance camera equipment to buy, you can call a security professional. Some companies offer home security audit services. A professional will survey your home and recommend security equipment. This can help you determine the right surveillance camera system to purchase for your home. The garage is a favorite place of entry for an intruder. If your garage door has windows, cover them with shades or curtains. It only takes seconds for an intruder to look inside to see if your cars are gone. They can also see items worth stealing such as tools and equipment. When the time comes to replace your garage door, buy one without windows. Install C-clamps if your garage door lifts on a rolling track. The clamp will prevent an intruder from lifting the garage door on the outside. You can also install a lock on the inside of the garage door, if you are going to be gone for a long period of time. An open garage door with a truck parked in the driveway does not look suspicious to the casual observer. Automatic garage door openers can present a security problem. If you have an older garage door opener, and you have not changed the default code, then you run the risk of a potential thief guessing the code. That is because you must manually change the code from default to a new code. The newer garage door openers come equipped with rolling code technology. This means that each time you open your garage door, a new code is transmitted. This prevents a potential thief from figuring out the code because there are over one billion security codes. You should also use a garage door opener that fits on your keychain instead of the kind that fits on your vehicle’s visor. Be sure the door that leads into your home from the garage is made out of solid wood or steel. You should also install deadbolt locks on every door that leads into your home. The deadbolt should partner with a quality lock set. It is an extra inconvenience to have to use a key to enter your home from the garage, but you will reduce the chance of an intruder breaking into your home. Home security involves multiple steps to increase your level of security. If you own a small dog that barks a lot, then you have a good chance that a potential intruder will choose another home. Small dogs bark a lot and often deter an intruder even more than a large one. An intruder wants to be able to enter and leave your home quickly. Most intruders are in and out of a home within minutes. They know the faster they can get inside your home, then the less likely they are to be caught. Place security stickers on the front and back windows of your home. The back door or back windows is a common entry point for intruders. Placing them on the back as well as the front will make an intruder think twice before breaking into your home. Keep valuables such as jewelry, guns and cash out of sight. You can invest in a quality safe or keep them hidden in an unusual place such as the kitchen. Most intruders will not bother to go into the kitchen. The master bedroom is the room that usually holds the valuables. You must think like an intruder and look at your home the way an intruder would. If your neighborhood has a community watch group, you can join and attend their meetings. The neighborhood crime watch program is an excellent way to keep informed about local burglar activity. Some city and county law enforcement agencies offer community meetings about crime. You can attend these meetings to learn more about your neighborhood. If you are going on vacation or a business trip, let your neighbors know how long you will be gone. You can leave a spare key and ask them to check on your home periodically. Knowing most of the neighbors in your community is a great way to reduce crime. When you are away from home for extended periods of time, make sure your home looks like someone is there. You can park a neighbor’s car in your driveway, and hire a lawn service company to maintain your landscaping. If your home looks empty, then you could be increasing your chance of home intrusion. Make sure you don’t post vacation pictures on social media sites while you are away. This is a great way to tell everyone that no one is at home. You can also purchase timers for your lights, stereo and television. These timers will make your home look like someone lives there. You can also install security sensors on your windows. These sensors will sound an audible alarm if someone tries to break or open your windows. Motion detecting lights and cameras offer a great way to protect your home. You can program them according to weight or size. This is especially important if you have pets because you can avoid false alarms. Most law enforcement agencies will charge you a fee for false alarms. That is because false alarms take away valuable city resources that could be utilized elsewhere in the city. Smoke, fire and carbon monoxide detectors should be a part of your security plan. Carbon monoxide poisoning can occur if carbon monoxide levels are not monitored. If you have a gas stove or fireplace, dangerous levels of carbon monoxide can accumulate before you realize it. That is because carbon monoxide has no symptoms. You cannot smell or detect the odor. Use several home security methods that combine to make your home a safer place to live. Develop a good home security plan that works with the entire family. Contact us today at (561) 288-5258 or toll free (866) 573-8878 to receive further information.